"Pink" (Nadeshiko) from "An Elegant Flower Calendar" (Furyu hanagoyomi). The picture is based on a pun between oshiko, the child's word for "peepee" and nadeshiko, the name of the dianthus flower. Perhaps a few words should be said about the setting of this print. Is the woman the child's mother? One would assume so, but that is not always the case. Sometimes the woman is a nurse, a relative, or someone who plays some other role. There seems to generally be a rush to judgement by viewers. In fact, print dealers might be able to make a sell more easily if they describe a print as a 'mother and child,' not matter how fictitious that appellation might be. Is the child cranky, just waking up or is it ill? Is the woman worried about the child's health? Cues may be found in the child's toys which may also double as talismans in an effort to fend off evil. One is a monkey dressed as a priest, riding atop a red tai. It would be pulled along behind the child like a small-scale religious float. Another is a puppet which doubles for a man dressed for a lion dance or shishimai. He is even wearing a miniaturized lion's-head mask. The third toy may be a top. Each of these often had some kind of spiritual meaning. Traditionally Japanese toys were not just toys. The woman may actually be a prostitute, whether she is the child's mother or not, because one of the other prints in this series is clearly a high-ranking courtesan. 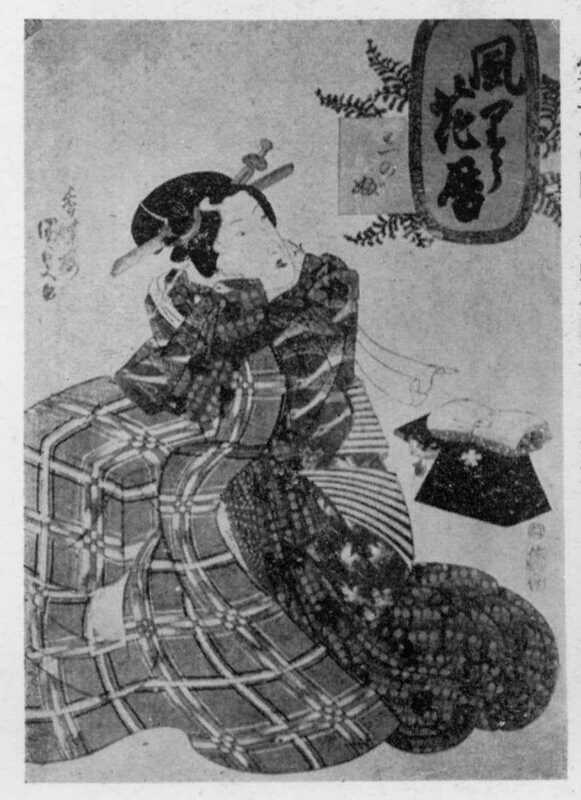 The other example of a woman that we found may also be a courtesan who is sitting heavily robed because of the cold warming herself by a kosatsu or brazier. Another thing to notice is the beautiful design of the woman's robe. Printed in an indigo blue with a white bats motif in reserve. Behind her is her elaborate, expensive, folded bedding. Use this site's enlargement tool to see the details up close. The Kunisada Project in Germany notes that there are supposed to be 5 prints in this series. One can be seen in the link above. There is also another image of an oiran about to get under a kaya or mosquito netting to avoid being bitten. We found a reproduction of this print in an Osaka University pdf file. We found a color detail from the print mentioned above. It is from this series at a Japan Twitter account. Although only part of this print is shown there is enough of the title cartouche visible to make this identification possible. A beautiful courtesan is kneeling down, looking back over her shoulder. She is holding a packet of folded papers in her teeth. The bottom of her robe is decorated with two large red crabs.